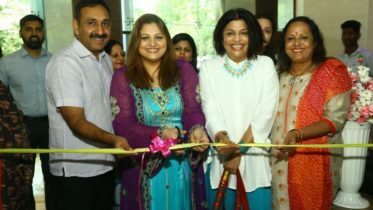 Chennaiites celebrated this festive season with fun, frolic and fashion at The Label Bazaar, India’s most talked about exhibition hosted by Anam Mirza, acclaimed stylist and sister of the famous tennis champion Sania Mirza. This one-day fashion extravaganza was held on 24th September at Hyatt Regency, Chennai. 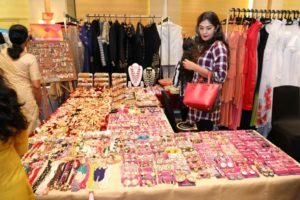 Providing all to do with fashion under one roof, from accessories to ethnic wear to shoes, bags and beauty, The Label Bazaar gave everything a shopaholic wanted in one place. With India’s ace sports star and fashion icon Sania Mirza as their ambassador, The Label Bazaar brought a shopping experience that Chennai will never forget. Apparel brands like Mulberry Blue, Work collars, Aarti Vijay Gupta, jewllery brands like Y Jewellery, Eurumme Jewellery and footwear brands including Chalk Studio and Oceedee showcased their trendiest collections for the first time in Chennai. The Label Bazaar is very well known for their extravagant shows in Mumbai, Chennai, Hyderabad as well as Dubai. “Chennai always seems to surpass our expectations in terms of fashion. With the emergence of so many bloggers, multi designer and flagship stores, style icons and shoppers, Chennai’s taste and quest for fashion always makes us want to come back for more,” says Anam.